Cheerleading sponsors often search for innovative fundraising ideas for cheerleading squads. Cheerleaders typically have to foot the bill for some or all of their uniform costs and other expenses throughout the year. Fundraising ventures provide a way for cheerleaders and their families to ease the financial burden of participating in the cheerleading program. Traditional fundraising ideas for cheerleading squads often include car washes and candy bar sales. Whether you go with a company that works with squads already or opt for your own homemade fundraiser, traditional methods have the advantage of familiarity. If everyone knows that every year your squad does a particular fundraiser, people will start to block out time or money to support your squad. One of the most common fundraisers involves selling candles. Veterans of these candle sales encourage sellers to take along a couple of samples when making a sales pitch so the costumer can see and smell the merchandise. In addition, if possible, offer a variety of candle sizes and maybe one or two other products, such as potpourri or candle holders. Yankee Candle is one vendor that works with schools, although there are several others. While some schools won't allow raffle sales, many turn to this simple fundraising venture as a means to make money. Cheerleaders can sell raffle tickets costing one or two dollars each for a chance to win a restaurant gift certificate, movie tickets, a bouquet of flowers, or other items. 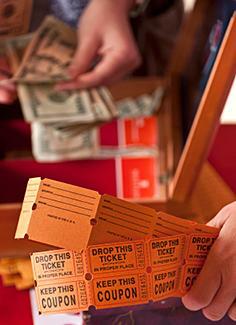 To set up a successful raffle, go to area businesses and ask for donations. Local businesses are often happy to help the community as it is good PR and drives in business. Hold raffles during major games, pep rallies, or during spirit week. A popular fundraiser for many school groups, cheerleaders often sell cookie dough to raise money for their squads. Depending upon the company used, participants can make as much as a 50 percent profit. One issue with cookie dough, however, is that it will need refrigeration until the delivery has been made. Otis Spunkmeyer is one popular brand that has experience working with schools. Doughnut companies like Krispy Kreme often partner with school-sponsored groups to sell boxes of doughnuts as fundraisers. This continues to be a popular fundraising choice. Candy bar sales make great fundraisers. Buyers can purchase as much or as little as they like. Keep in mind, however, that because of nutritional guidelines in place at most schools, candy sales may not be allowed on campus. Instead, canvas neighborhoods and businesses. World's Finest Chocolates is a popular chocolate company to consider. Consider selling school spirit items to raise additional funds. For instance, you could sell pompoms in your team's colors, spirit signs for yards, spirit decals for cars, or t-shirts to support your squad. When it comes to sales, you often have to invest money up front in order to cover the cost of the items before making your profit selling them, so be sure to set realistic goals for the squad. Local businesses like gas stations and restaurants are often quite willing to let cheer squads hold a car wash on their property. Many squads ask for donations for car washing services in lieu of charging a set price per car. With the management's permission, set up a gift wrapping table at a local store during Christmas shopping season. Make sure your table has plenty of gift wrap, scissors, tape and helpers! You can charge a fee or ask for donations. You designate a certain date as the cheerleading fundraiser night. The restaurant or restaurants agree to donate a portion of their proceeds to your team on that specific night. You make flyers, posters, announcements and other marketing materials to promote dining at those restaurants on that night. Cheerleaders on your squad dine at the restaurants, take pictures and provide short cheers throughout the night at the restaurant to promote sales. Depending on how many restaurants get involved, you could earn several hundred or several thousand dollars in a single night. You may want to see if certain restaurants would be willing to set up a monthly, or even weekly, cheer night to help bring in funds throughout the year. When one person's junk becomes another person's treasure, money can be made and the profits can yield almost 100 percent. Don't limit the yard sale to just cheerleaders and their families. Ask other students, faculty, and friends to donate their unwanted items to the yard sale, and be sure to advertise a week or two in advance. Gather a variety of vintage and period clothing, then find a photographer who would be willing to donate his or her time to take photos in exchange for advertising in the form of posters and flyers announcing the event. Charge a small fee for reservation tickets, which should yield a 100 percent profit, then raise the cost of printed photo packets. After the photographer is paid for the packets, the surplus charge becomes profit for the squad. This is certainly a nontraditional method for raising money, but it can result in some nice profit without a lot of expense. Host a doggy bath service where people can bring their pooches in for a good cleaning. Complete the pampering by selling homemade doggie biscuits. Be sure you have pet-appropriate shampoos and plenty of towels and water on hand. Charge a set rate for the dog baths or ask for donations. 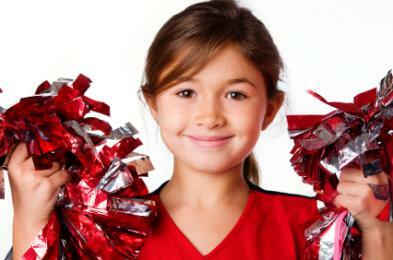 You can offer a youth cheer clinic to local elementary students for a nominal fee. Teach the kids basic cheers and moves, then put on a performance for their parents. You can even invite participants to cheer with you at a game during half time. Not only will you raise money during the clinic, you'll also be encouraging team spirit and involvement in younger community members. If someone on your squad is good with a camera or knows someone who is a talented camera person, put those talents to work. Consider creating a video that features a compilation of the squad's performances at games and competitions. Sell these videos to friends and family. You could also create how-to videos on cheer techniques and cheer dances and sell those in conjunction with a cheer camp. Dodgeball tournament - Charge each team that wants to participate, then offer concessions and T-shirts for additional money. Powder-puff football game - Set up a 'cheer squad vs. dance squad' football game. Have varsity football players play the role of cheerleaders, and charge the spectators admission. Who's the best athlete? - Set up a series of competitions that test speed, agility, flexibility and other athletic markers. You can either charge the participants or the spectators for this event. Male cheerleader competition - Recruit the male athletes at your school and teach them basic cheers and other skills. Then, host a competition to see which male athlete would make the best male cheerleader. Purchase a large number of rubber ducks. Tell consumers that you are "selling" the ducks for a specified amount of money, and then write the name of the buyer on the bottom of each duck in waterproof ink. Choose a date on which the ducks will "race" in a local creek. (Be sure you get permission from city officials before you begin this fundraiser!) Ask local merchants to donate prizes for the winners. Winners could include fastest duck, slowest duck, and other fun categories. Consider auctioning off the cheerleaders on your squad for a workday. In this type of fundraiser, cheerleaders (individuals or the entire squad) are auctioned off for certain tasks, like cleaning out a basement, painting a house or doing yard work. Local individuals or businesses bid on the particular work to be performed, and the cheerleader or the squad must perform the work in exchange for money. While food sales are common fundraisers, selling fresh fruit can give your squad a unique approach. Approach your local green grocer and ask if the store would be willing to sell you cases of oranges and grapefruits at cost so you can resell them at a profit. Create a simple flyer that states the cost per case, the exact type of fruit, the number of cases ordered and a delivery date and location. Be sure to give your sponsor credit on the flyer. Some free advertising creates good will and may generate future sales for the grocer. To protect the team from a loss, make sure the grocer will allow you to order only the number of cases you pre-sell and pay for them once you've collected payments from your customers. Cheer and Chomp - This cheerleading fundraiser company features must-have merchandise such as candy pom poms, cheer poms, and megaphones. Fasttrack Fundraising - Find a nice variety of items to sell with Fasttrack Fundraising. Choose from items like bracelets, gourmet lollipops, and discount cards. EZFund.com - Visit this website and request a free sales kit. Popular fundraising kits for cheerleaders include lollipops, cookie dough, and gourmet snacks. JustforMeCandles - Selling kits include free sample chips, and candles are available in 20 scents. SchoolFundraisers.com - Involve your whole community in your fundraising efforts by using an online thermometer at this site to track your sales. Fundraising takes planning and initiative, but those who do it successfully discover a lucrative way to supplement those never-ending cheerleading expenses. Consider both the traditional and nontraditional routes when looking for fundraising venues that work, and watch your profits exceed your wildest expectations.